The Bead Bazaar introduced Washington State artist Jean Christen to Bellingham this spring, and her pendants quickly became the favorites of many. We’re now excited to announce that we have received a fresh shipment of this local artist’s beautiful work, in a lovely range of variety; these are guaranteed not to disappoint any who have been patiently awaiting their arrival. Many of Jean’s pieces feature naturalistic images such as dragonflies, ravens, turtles, and other animals besides. Organic colors compliment Jean’s totem-esque faces, and her use of texture serves to give each pendant new layers of depth. Three words that perfectly describe Jean’s work: Organic, Ethereal, and Whimsical. 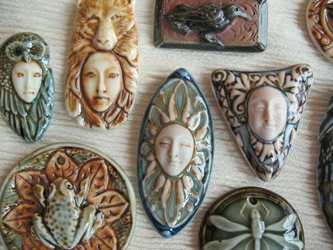 Because Jean creates all of her own glazes, the colors and finish of each pendant is unique. 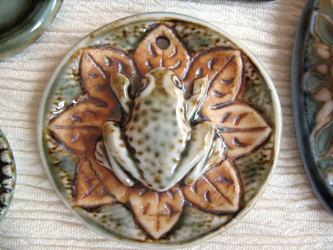 More information about Jean’s clay-working and firing process can be found here; suffice it to say, this artist infuses each pendant with love and inspiration. These pieces go quickly, so don’t let go of an opportunity to wear something absolutely outstanding. Be sure to come in and revel in the beauty that can be created by a fellow Washington State artist! Silver or Gold Plate: A plated finding will have a thin layer of real silver or gold over a base metal, usually brass. The layer runs between one thousandth and one millionth of an inch thick, meaning that over time, the plating will wear away and reveal the brass underneath. Many manufacturers use nickel in the plating process; this is where skin sensitivities become a problem, because nickel commonly irritates people’s skin. While there are some who can wear plated metals with no problems, other will have to skip this option for something less reactive. Nickel Free: Recently, we’ve found more and more companies that produce a selection of nickel free findings. They are still only a plating over brass, by these companies don’t use nickel in the process, so for some of our sensitive customers, they have provided a cost-efficient alternative to sterling silver. Our nickel free findings also come in antiqued brass and antiqued copper platings, offering a nice variety of color to choose from. Be a little cautious when first testing these out: some people still react to them, but far fewer than the findings that include nickel. Surgical Steel: Surgical steel uses no plating, just a steel alloy through and through. Many sensitive people can wear surgical steel with no problems, but there are still a few that react to it. This is because surgical steel actually has a small amount of nickel in it (about 8% according to a beading magazine that I read), so if your skin is sensitive enough to pick it up, then you’ll need to bypass the surgical steel for nickel free, sterling silver, or gold-fill findings. Sterling Silver: Sterling, like surgical steel, is an alloy, so it’s the same metal composition clear through the piece. Most sterling pieces are stamped with the numbers 925. This stamp indicates the amount of pure silver in a sterling piece- 92.5% pure silver with some other metals mixed in. Because sterling is composed mostly of pure silver, it works well for many people with sensitive skin. However, there are a few who still are bothered by it, because that other 7.5% is composed of a mixture of base metals that includes- you guessed it- a small amount of nickel. It’s less nickel than surgical steel, but still enough to cause problems for some. In this case, a person would need to move on to gold-fill. Gold-Fill: Gold-Fill is similar to a plated finding; it’s a layer of 10, 12, or 14kt gold over a base metal. However, while a plated layer of gold is only one thousandth of an inch thick, a gold-fill layer is closer to one tenth or once twentieth of an inch thick. This makes the difference between a thin layer that rubs off too quickly for comfort, and a thick shell that holds up for a much longer period of time. Sometimes a gold-filled finding will be labeled like this: 14/20 Gold Fill. This indicates that a 20th of the total weight of the piece is made up by a 14kt gold shell. Fine Silver: At the Bead Bazaar we only have a couple of guages of wire available in fine silver. Fine silver is much purer than sterling; 99.9% pure silver, compared to 92.5%. This makes it even friendlier to sensitive skin than sterling is. Niobium: Niobium is a metal alloy that was designed to be hypo-allergenic. Because of this, many people can wear it even when sterling bothers them. It also comes in a fun range of colors, from gray to brown to fluorescents from the rainbow. There are a couple other metal types we don’t carry: Vermeil and pure 10, 12, or 14kt gold. Vermeil is a gold plating over sterling silver. It won’t be plated with as much gold as a gold-fill finding, but the metal underneath is more hypo-allergenic, so Vermeil is sometimes a less costly alternative to gold-fill. Pure 10, 12, or 14kt gold are the most hypo-allergenic metals for the most sensitive skins, but can be much more costly because of the amount of gold used. When experimenting with different metal types, take it slow and easy to avoid irritating your skin, and make sure to pay attention to how your skin reacts to any new metal. We hope this guide is helpful for interpreting the many options out there! If you have any other questions, feel free to call or stop by the Bead Bazaar.